Chamber capacity: tailored to suit application. Constant research and development over the decades using a flow bench for initial investigations, then thoroughly tested on engines on engine dynos, rolling roads, and ultimately the race track has culminated in the current race head specification. Instantly recognisable from many other race head types by the distinctive port shapes and sizes. 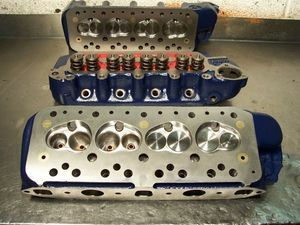 Particularly the valve sizes used and the exhaust ports, both of which that are much smaller than other producers. Fitted with top quality unleaded fuel compatible exhaust valve seat inserts. All heads are done to order to cater for specific applications and requirements.